in group, our expert guides are waiting for you to book a tour! If you want to join, make a reservation. enjoy if you join our exclusive Street Art journey! How well do you think you already know Berlin and its Street Art? Berlin is a city with a very turbulent past, which had its ups and downs, rights and lefts, Easts and Wests, and shook through the entire 20th century. Still, on the contrary to what might be expected, the city embraces its past, both the ugly and the beautiful part, and courageously implements it into its present – and that is what makes Berlin different from any other place on our planet. Thanks to this progressive, liberated attitude, the capital of Germany has the spirit of a capital of the world, a true cosmopolitan nature, equally trendsetting and inclusive. Due to (or maybe even thanks to) all the tough circumstances that eventually made it stronger, Berlin has become the world’s center of alternative culture. Just think about it – today, we have the privilege to touch and see the remains of the infamous Berlin Wall, a landmark that used to symbolize oppression and division, but once it got demolished its ruins became an amazing street showroom which represents freedom, unity and the power of creative minds. The East Side Gallery is just one of the very popular examples of how the people of Berlin never give up on their heritage, no matter what it consists of, and virtuously turn the ill-favored things into the most outstanding parts of their city. It is just a tiny piece of a much greater picture that makes Berlin what it is today, parts of which are deeply hidden beneath the surface, while other stand right in front of you, inviting you to react and to take part in Berlin’s versatile cultural life. Berlin will win you over with the most vigorous, invincible youthful energy, which can be felt with every step you take in this city, whether you’re a Berliner, or a tourist. And after all, as Kennedy said, everyone is a Berliner. Let us help you feel that way. Berlin has been officially given the “City of Design” title, and some also like to call it the mecca of graffiti and street art. Public art was simply destined to find its home in Berlin, and it is where you’ll find it at its best. If there is a place on Earth where Street Art really belongs then it is definitely the streets and the alleys of our city, given that its current identity was created a few decades ago with a similar idea in mind, with reference to Street Art and confidence in the power of the people, free people of Berlin. Some of the world’s most famous murals are located here, and murals are actually not even the main part of Berlin’s rich Street Art “collection”. Nonetheless, you will find that the new ones, the large and the small ones, stickers, stencils, paste-ups and public installations are constantly being made, which makes Berlin one of the ultimate leaders when it comes to the progress of urban culture. Once you get in touch with the streets of Berlin, you’ll see the works made by the most prominent Berlin-based artists, such as Alaniz, XOOOOX, Alias, El Bocho, SP38, Negative Vibes, Mein Lieber Prost, Various and Gould, Berlin Kidz. 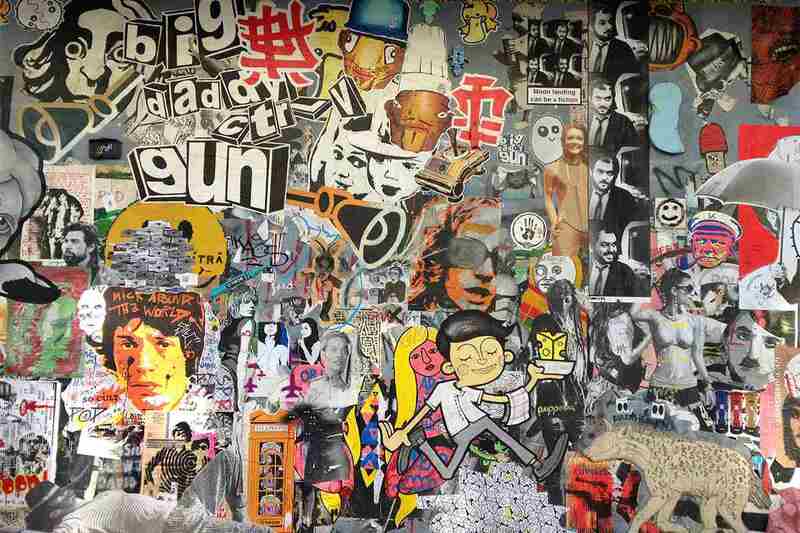 But apart from them, you’ll also recognize some of the works made by the artists who were just passing through Berlin, leaving their mark on the walls of this creative hub. You’ll come across a number of artists from Italy for example, such as Alice Pasquini, Agostino Iacurci and Blu, some of whose most popular murals were made here – although a few of them were removed recently, and reportedly by the artist himself as an act of protesting against gentrification and social injustice. Luckily, there are many other wall-art pieces waiting for you here, made both by the masters and the amateurs coming from all parts of the world. 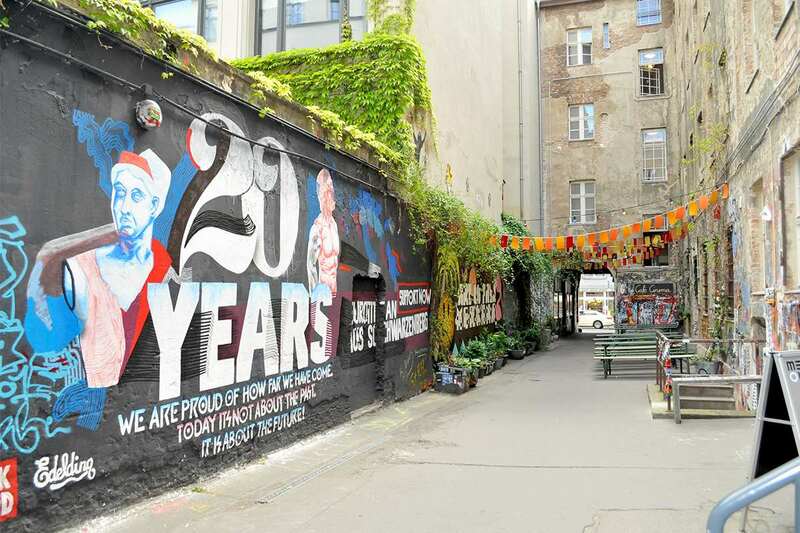 While you’re here, you will also be able to see the first Street Art Museum in the world, and come to realize that in Berlin everything is possible, even the idea to institutionalize an art form as radical as Street Art. As you can imagine, failing to notice the art made in Berlin’s streets and in public spaces would be very hard, almost impossible. But on the other hand, getting a complete, detailed and truthful impression of Berlin and its unique alternative art scene requires a more attentive approach, such as taking a guided tour. A well-tailored tour should give you a chance to experience all the particulars and unique features that the city offers, to inform you about its recent history, its current art scene and possibly to inspire you to take part in the “right here, right now” atmosphere. You will also find that there are many ways to get in touch with the local happenings and to get to know the popular stories related to Street Art in Berlin – after all, it is this accessibility that makes Berlin so lovable. 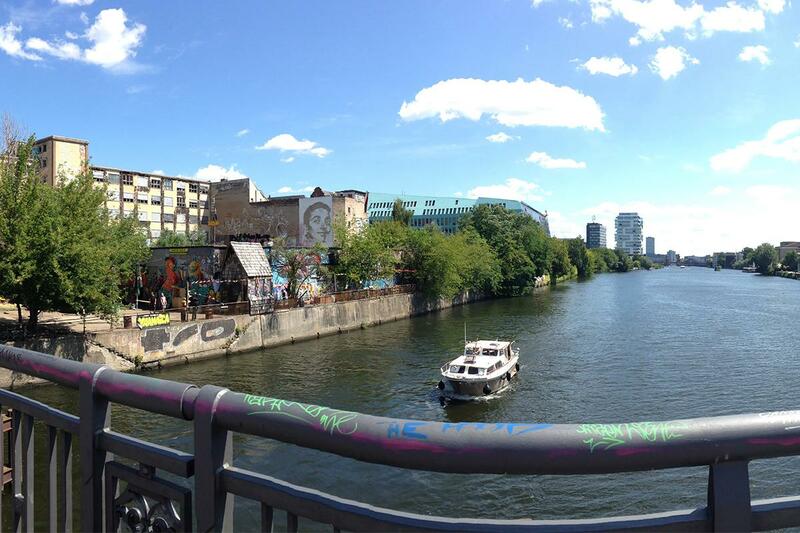 You will probably be advised to visit some of the most popular places in Berlin: Haus Schwarzenberg, Tacheles, the old Berlin Mitte district, the rmains of the Berlin Wall and the RAW area. However – if you’d like to get a real, in-depth sense of what Berlin is made of, we suggest you take a tour with us and let your knowledge go beyond what was already told a thousand times before. While there are many guided tours available for tourists and the locals out there, finding the professional, comprehensive and, above all, authentic guide is not as easy as you might think. Since Berlin has become quite photogenic, vibrant and attractive, we are well aware that some of its tales have already been revealed. That is exactly why our main goal is to place an emphasis on the active relationship between the culture and the context, and to make your visit more than worthwhile, helping you gain that which is directly given in experience, rather than someone else’s interpretation. Let us guide you through all the relevant locations and venues, point out all the important, the trivial and the lesser-known facts, help you distinguish the genuine from the fake and discuss the state of Street Art in Berlin today. We would love to provide you with the specific, unique and engaging information, rather than speculate on the worn-out stuff, most of which you can already find on the Internet. That being said, we won’t be shy of sharing any information that might be of interest to you, even to talk bout the potential threats to Berlin’s progressive art scene, and to mention both the good and the bad sides of its openminded spirit. We are going to reflect on any topic you might be curious about, let you know about the Berlin Wonderland years, address every interesting piece of street and public art in order to make this city’s story as illustrative as possible, perhaps even grab a bite of some great food. Berlin Street Art team consists of enthusiastic, dedicated people who are passionate about arts, and consequently very well connected with the scene and those who make it as special as it is today. What is even more important, we are more than willing to share our knowledge and experience with those who would like to truly get to know this amazing city. Instead of providing a standard, tourist-designed tour, Berlin Street Art will give you an honest yet professional input, backed up with anecdotes and rare ‘behind-the-scene’ stories. In addition, our tours are customized for the audience, depending on their specific interests, but always include all the interesting pieces of information which explain how Berlin became the place where this particular culture found its home, and why all of it couldn’t have happened anywhere other than in Berlin. We offer group and private tours in French and private tours only in English. In the end, our ultimate goal is to give people the opportunity to not only enjoy the murals, stencils and other forms of urban art in Berlin, but also to learn something that will help them truly understand the alternative culture and to understand Berlin. Finally, regardless of your own attitude toward Street Art or art in general, one of our goals will be to deploy Berlin’s resonant urban landscape as a backdrop for a myriad of great stories. What better way to dive into the true nature of Berlin, than to familiarize with its history and its culture through art? In return, Berlin will confirm that it is, indeed, a place which belongs to the whole world, as much as we all belong to it.